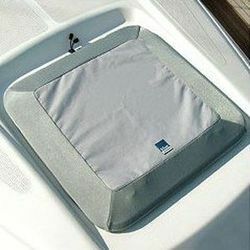 Quick acting watertight hatch cover is suitable for all kinds of marine hatches required quick acting and high pressure. There are 2 types: Type A round quick acting watertight hatch cover and Type B Square Quick Acting Watertight Hatch Cover. We are highly engaged for offering an exclusive assortment of Hatch Cover in the nation with the support of talented professionals at very affordable rates. Specifications Available in sizes 4" through 10"
We are engaged in manufacturing, supplying and exporting a wide range of hatch covers. In order to provide the clients with faultless covers, we make it a point to use only high-grade material for manufacturing this. For this purpose, we source the material from some of the most renowned and trustworthy vendors of the market. these are manufactured with high gloss chrome plating and are supplied with a rubber washer for better fitment on receiver tubes . These are manufactured with high gloss Chrome plating and are supplied with a rubber washer..
Spares : Hydraulic Motors & pumps. Dowmax, Dynapower, Rexroth, Kayaba, Ebara, Bauer, Vickers, Parker etc.